Moist to dry. Rich, moist woods and drier, upland woods, stream banks, stream terraces, valleys, ravines. Highly shade tolerant when young. Full to partial sun later. 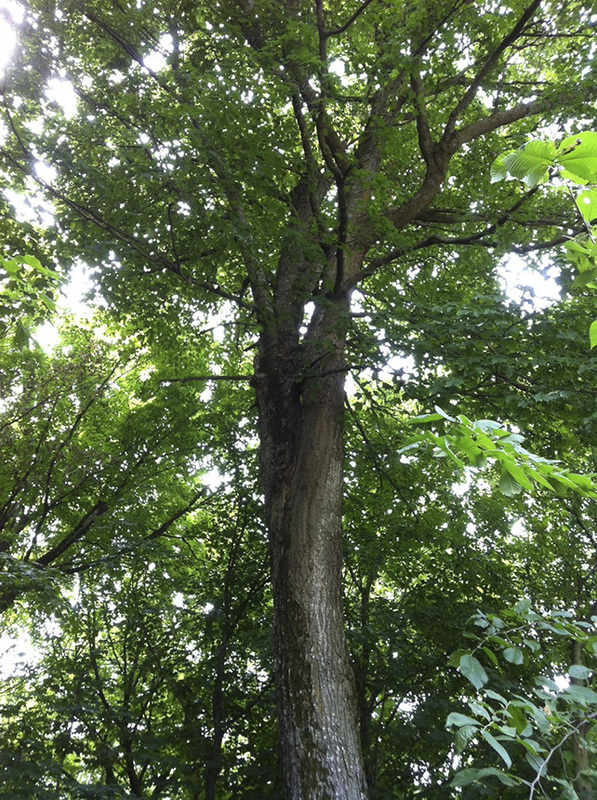 This is a long-lived, slow-growing, deciduous, medium to large, hardwood tree rising on a single trunk from deep, widely spreading roots. 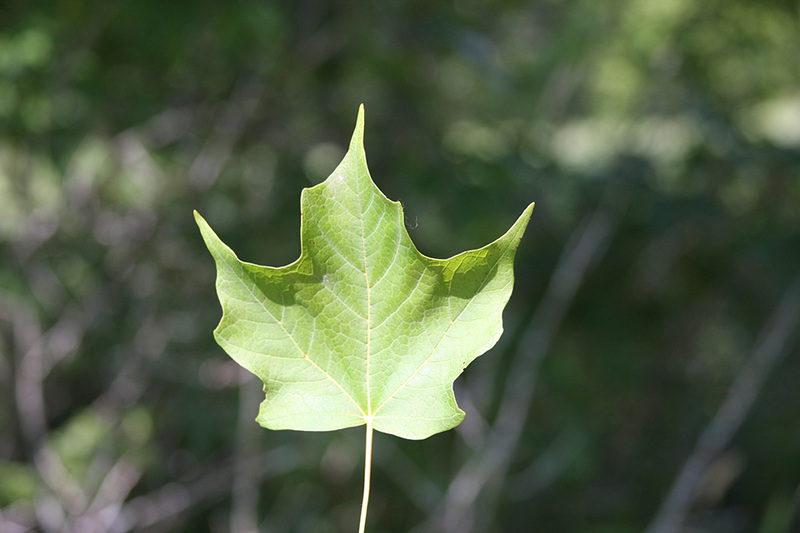 It is the most common maple in eastern North America. 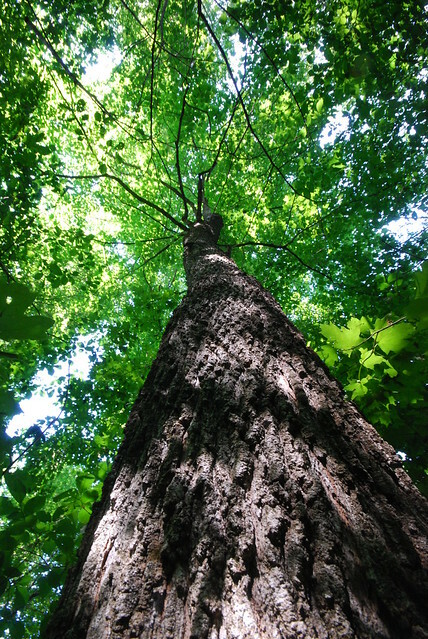 In Minnesota mature trees are usually 40′ to 70′ tall and 24″ to 36″ in diameter, though large individuals can reach over 80′ in height. They can live 300 to 400 years, but typically live 150 to 200 years. 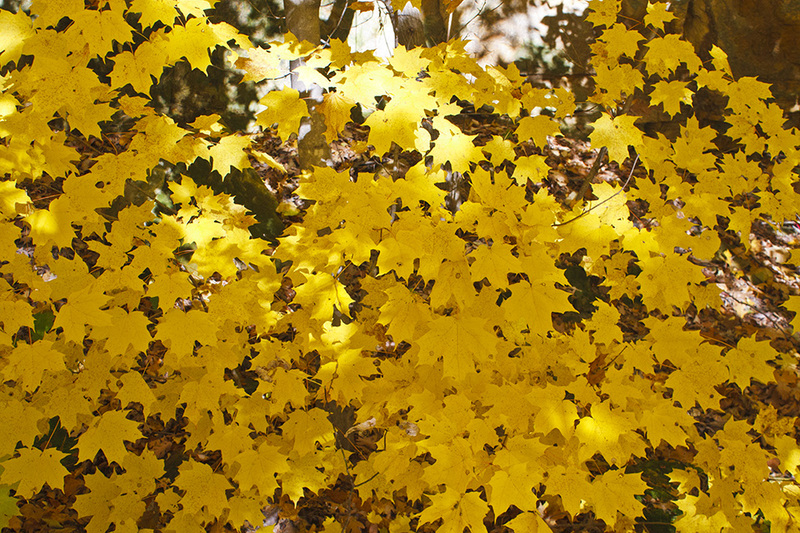 The foliage is dense and forms a dense canopy, which restricts understory and turf growth. The crown is dense, broad, round or oval, symmetrical, smooth, and round-topped. The trunk is straight and much branched. The branches are opposite, short, sturdy, and ascending to spreading. Older, lower branches droop. 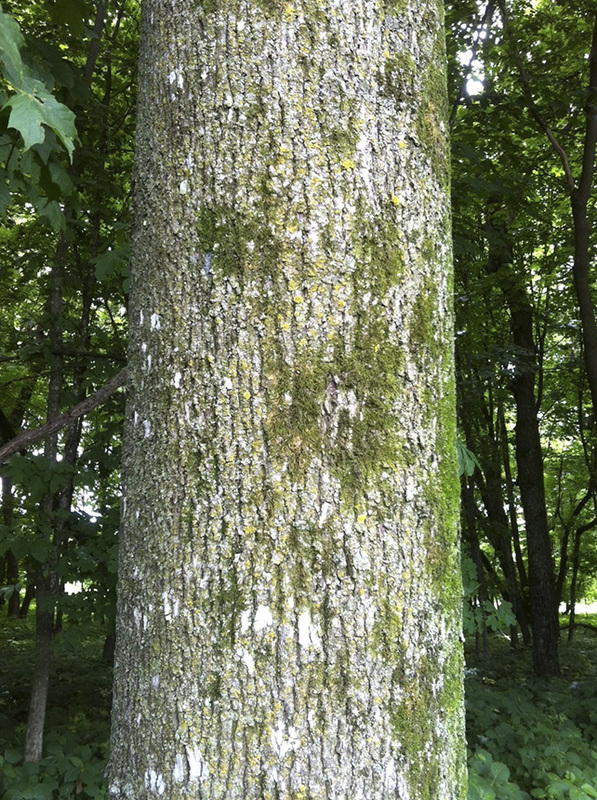 The bark on young trees is gray to dark gray or brown and smooth or warty. 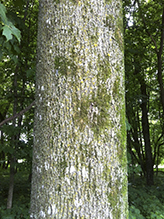 On mature trees the bark is dark gray with deep, irregular furrows and thick, long, irregular plates that curl at the top and bottom edges. 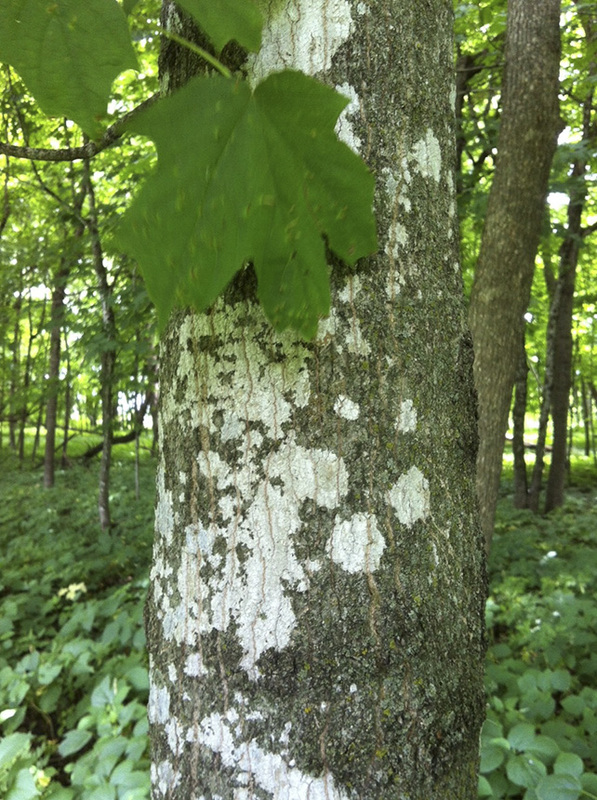 Older bark is highly variable in appearance. It may be brown, gray, or nearly black, with orangish interior bark. It may have vertical plates curled at the top and bottom, it may be semi-ridged, or it may have overlapping shingles. The twigs are thin, reddish-brown to green, smooth, hairless and shiny. They appear in a V-shape on the branches. The younger twigs have obvious, small, lighter, pore-like openings (lenticels) that are not raised much above the bark surface. 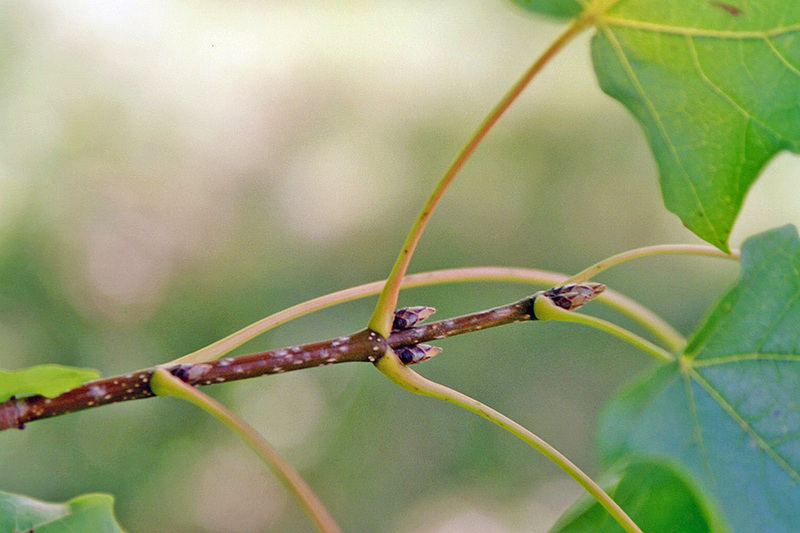 At the end of the twig is a brown, ¼″ to ⅜″ long, sharply pointed winter bud with tight scales. The leaf scars have 3 bundle scars. The buds are dark brown, egg-shaped, ¼″ long, sharply pointed, and hairless or slightly hairy. They are composed of 6 to 12 dark brown to nearly black overlapping scales. 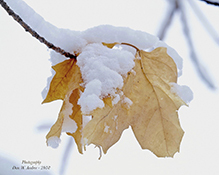 The leaves are opposite, 2⅜″ to 6″ long, and 3″ to 6″ wide, sometimes wider than long. They are on leaf stalks (petioles) that are 1½″ to 3″ long and sometimes hairy. 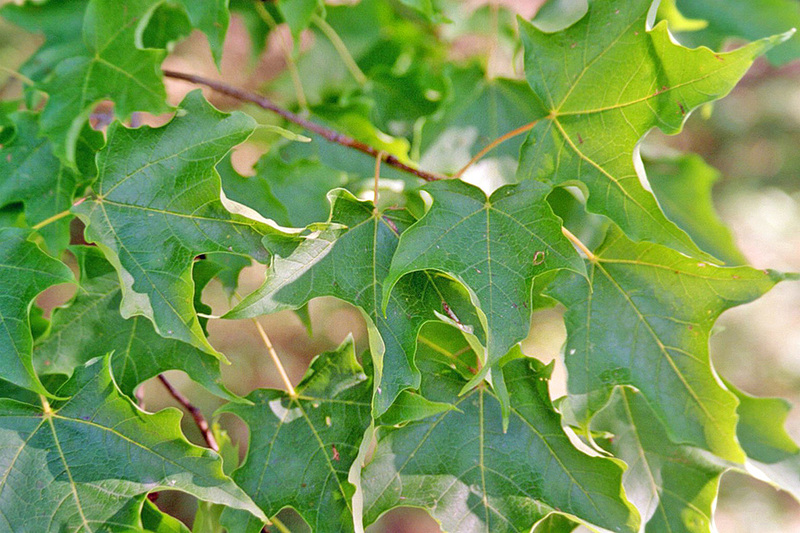 When cut, the petioles exude a clear sap. There are no prominent stipules at the base of the petiole. The blades are palmately lobed with usually 5 pointed lobes, rarely only 3. The lobes taper to sharply-pointed tips and sometimes have small, secondary lobes. The space between the lobes (sinus) is rounded and usually forms an angle of less than 90°. The two bottom lobes are much smaller than the two lateral lobes. The central lobe is cut ⅓ to ½ of the way to the base of the blade, and is widest at the base or has nearly parallel sides. The sinus at the base of the leaves is open and the two bottom lobes do not overlap. The upper surface is dark green and hairless. The lower surface is pale green, bluish-green, grayish-green, or whitish, is sometimes covered with a whitish coating (glaucous), and is either hairless or hairy. The margins are sometimes slightly curled under and have a few coarse, irregular, wavy teeth, but they are not double-toothed and do not have fine teeth. The sides and tip of the leaf do not droop. In the fall the leaves give a brilliant display. They turn yellow, orange, scarlet, or dark red, often changing from one color to the next in progression. 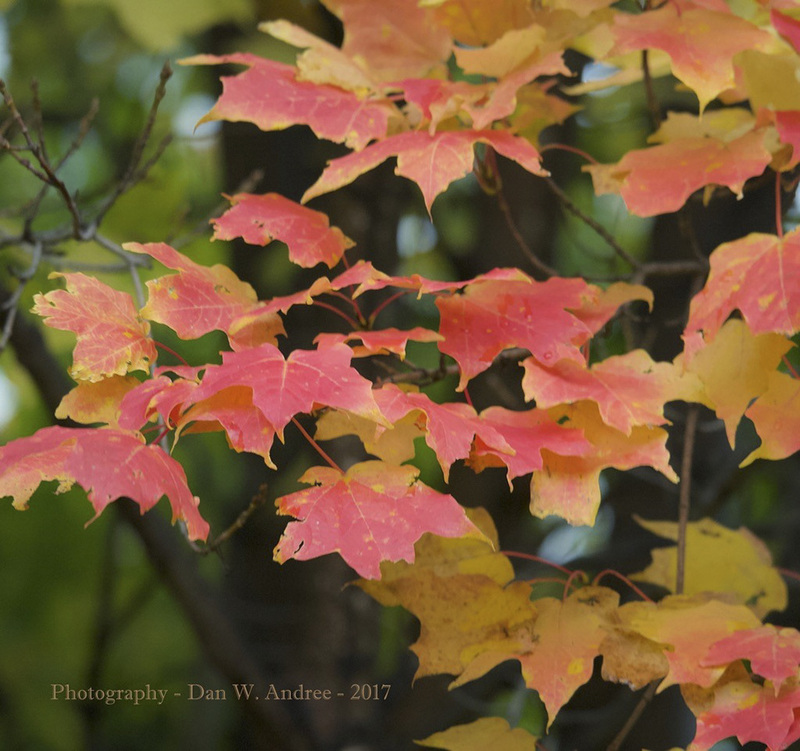 The foliage on a single tree may show all these colors plus green at the same time. Often, the inner leaves are yellow, the outer leaves with sun exposure orange tinted with red. Fallen leaves break down quickly. The inflorescence is a tassel-like cluster of 8 to 14 flowers at or near the tip of the branches. Flowers may be male, female, or both (perfect), with all three types borne on the same tree and even within the same cluster. They appear identical, having both stamens and pistils, but usually only one of the organs is functional. They are produced in late April or early May and are usually fully formed before the leaves appear. They are lime green and hang downward on 2″ to 4″ long, hairy, drooping stalks. The flowers are pollinated by wind and bees. 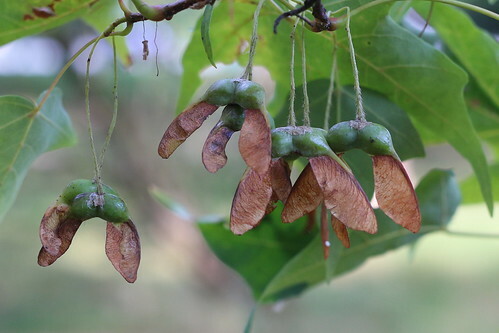 The fruit is a pair of dry seed cases with papery wings attached (double samara). The samaras (or keys) occur in clusters that droop downward from 1″ to 3″ long stalks. The stalks are longer than the wings. The seed cases are plump, attached the the stalk, and slightly connected to each other. The wings are typically 11 ⁄16″ to 11 ⁄16″ long, ¼″ to 7 ⁄16″ wide, and are parallel to each other or slightly spreading. The overall shape of the two keys is that of a horseshoe. Usually only one seed case contains a single, viable seed, although sometimes both contain seeds, sometimes both are empty. 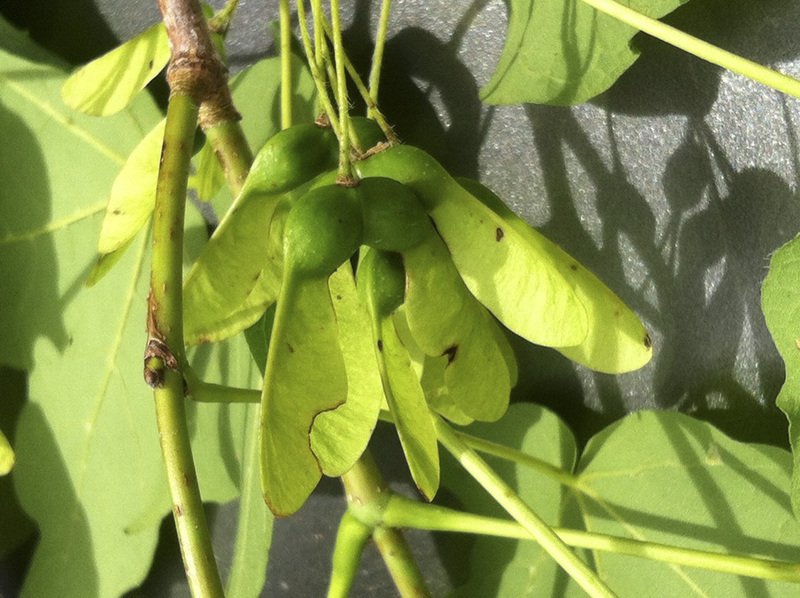 The keys are hairless, green initially, turning yellowish green when the seeds are mature, then brown in the fall. 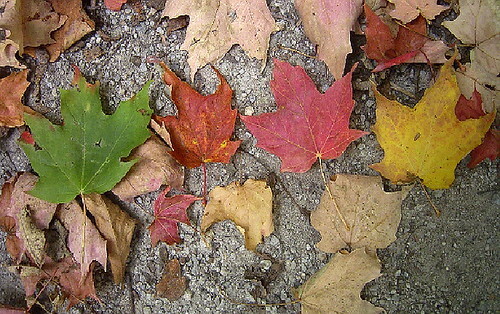 They fall just before the leaves. Paired keys remain united when they are shed. The seeds are ¼″ to ⅜″ long. 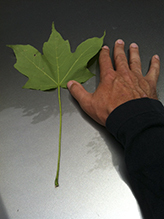 Black maple (Acer saccharum ssp. nigrum) bark is darker, thicker, and more deeply furrowed, but this may not be obvious. 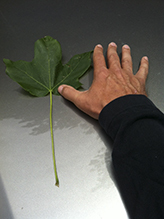 The petiole is obviously hairy and has prominent stipules at the base, though these may fall off. The upper surface of the leaf blade is darker and duller. The under surface is hairy. Fresh leaves droop at the sides and at the tip. The base of the leaf stalk is larger. The sinus at the base of the leaf is often closed and the two bottom lobes often overlap. 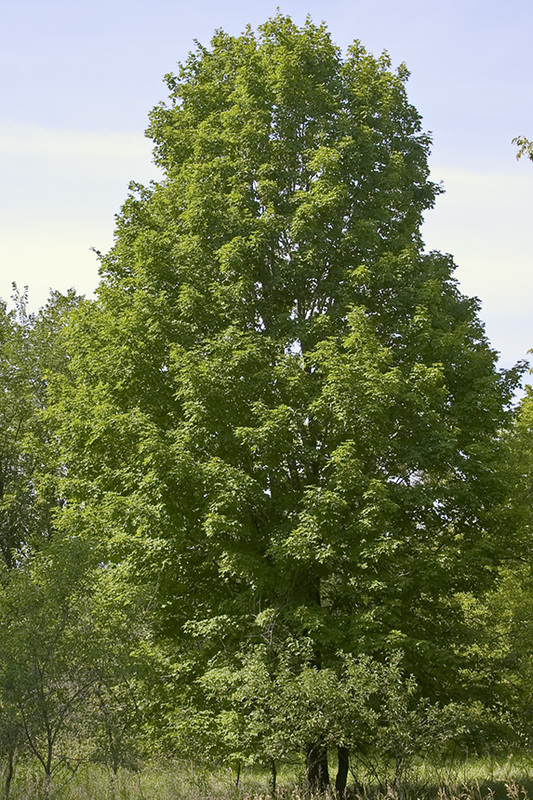 It hybridizes readily with sugar maple, producing a range of characteristics that make it difficult to distinguish between the two. 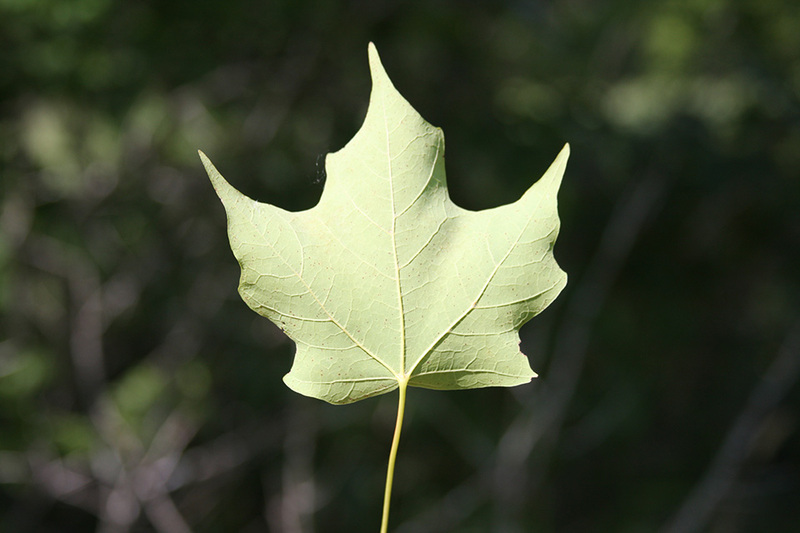 Norway maple (Acer platanoides) has milky sap. The leaves are wider. Crimson erineum mite (Aceria elongatus) creates irregular velvety patches (erinea) on the upper surface of the leaves. The patches are green at first, soon turning crimson. 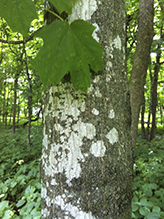 The champion sugar maple in Minnesota is on private property in or near Plymouth, in Hennepin County. In 2009 it was measured at 81′ tall and 137″ in circumference (43½″ in diameter). 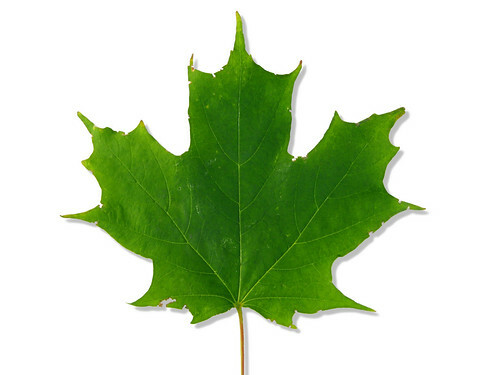 This is the state tree of New York, Vermont, Wisconsin, and West Virginia. Sapsuckers often drill holes in the outer and inner bark in the early spring to attract insects on which they feed. Around the same time humans often hammer in taps from which they hang buckets to collect sap for maple syrup on which they feed. Tiny raised area within a leaf scar, formed from the broken end of a vascular bundle. Similar to a hand. Having more than three lobes or leaflets that radiate from a single point at the base of the leaf. A space, indentation, or cleft, usually on a leaf, between two lobes or teeth. The state tree of New York. A New York City park tree native to North America. Richard Weber, owner of Springhouse Gardens in Nicholasville, Kentucky, led the Tree Walk at The Lexington Cemetery. In this video, he talks about the Sugar Maple.